If you follow me on The Equinox Fashion Instagram, you will notice that 89% of the photos are me and a few pairs of sunglasses. They are literally my best friends because my eyes are too sensitive to look straight during the day, especially the sun in Krung Thep is very bright and strong. However, one good thing about having the sunglasses on is that no makeup is needed. I rarely put any cosmetics on, just a pair of my go-to accessories. Recently, I have partnered with Carin eyewear, the Korean based brand with a touch of Scandi design. As seen on a lot of K-pop stars and celebrities like Suzy, she is the face of Carin SS16. The modern designs feature edgy rounded crystal shades with the sleek colors. 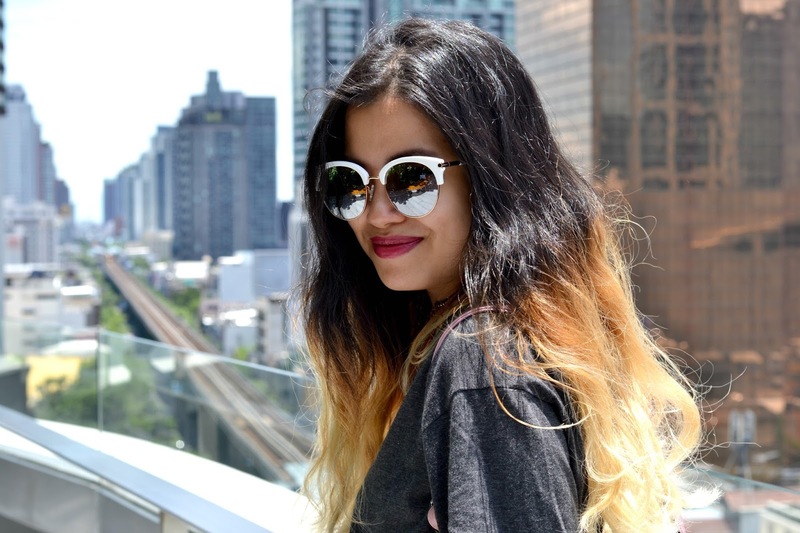 In fact, I couldn't decide between the acetate or metal combination frames..So, here I will show you how I wore these beauts in the heart of Bangkok, Thailand. "Scandi fashion sunglasses" This is the slogan of the brand. And I think the one I have is really European and comfortable for my eyes. Actually, all models are designed in a modern Scandinavian feeling. The combination of the chic flair and retro vibe is such a well-balanced for the luxurious high street fashion. Frankly, these fierce sunglasses from Carin are one of my favorites so far. I was thinking about getting the pink one, but white framed would be more functional in terms of my street fashion style. As you know my signature ombre hair always look insanely pops on the dark outfit. Therefore, the additional white shade from the sunnies would be a perfect match. My rule is the 'max 3' which means I can combine any colors with the maximum of 3 palettes. That is enough. So, ombre, dark grey and white with the little pink flair were the choices of the day for a Thai fashion blogger like me. If you are thinking about getting this retro cat eye designed sunglasses, you will need to spice up the wardrobe a bit. They can be matched with any fashion styles, however, I would suggest that they can be incorporated better with the cool and edgy looks. This's my daily outfit as I always look for something comfortable and casual. Yet, the accessories of the day were these sunglasses and shoes. These items could bring out my outfit to become more interesting in the street style taste. Moreover, I also added the sexiness by the pigmented purple lipstick from Urban Decay. I am not going to lie but it's so creamy and the texture's even better than Chanel. you always look so good in sunglasses! Me and you both Gail darling. The reason I have a gazillion pairs of sunnies is cos my eyes are sensitive. It gets annoying sometimes when I feel like I put a lot of effort into my eye makeup and want to show off my skills, LOL. Recently I'm training my eyes to go without them and I feel like I'm somewhat successful. I love you stunning mirrored pair. Too coooooolllllll!!! Great brand. I will love to order from them. You look impeccable darling! I'm so in love with these sunglasses girly, and you totally wear them with confidence! I have recently learned the trick of wearing sunglasses in my outfit shoots; they hide my sweaty concealer streaks under my eyes! I am in love with these sunglasses. They look so amazing on you! NEW GET THE LOOK POST | Shades of Autumn: Jeans plus Beige. Those sunglasses are so fun, what a great statement pair! :) Lovely with a casual jeans and a tee outfit like this too. Amazing shades! I need a pair! Glasses very cool! I love your backpack and shoes! I love your sunglasses. It looks so good on you ! I hadn't realised the sun was so strong there - though what a great excuse to live every day in gorgeous sunglasses :) This pair look amazing on you, I love the white frames. Also, in the first image where a strand of hair falls slightly over your face, I thought you had a nose ring put in haha, but funnily enough, I think it'd really suit you!! Obviously we have the same habits and prefer to wear sunglasses on our pictures :) But I think I wear them to 99 % :) Love the glasses you show here, extremely cool! Didn't see such a beautiful sunglasses for a long time. These glasses are really cool and they look great on you! I always have to have a pair of sunglasses as well! These look great on you! Lovely sunglasses, it's really feminine and it suits you so well. I've never heard of this brand before, so I appreciate you introducing me! This pair looks SO good on you! I love that they're round, but the contrasted frame creates somewhat of a cat-eye effect, which I love! Thanks so much for sharing, gorgeous, and I hope you're having the most amazing week so far! Love the sunnies you rock them. That's a really gorgeous pair of sunnies. What a beautiful frames 💕💕 love your sunnies! What a cool and elegant sunglasses! Looking super amazing and those shades are FAB! Sunglasses are so important! I have a few pairs that I rely on for every look. I never leave the house without them. Love the pair you have on now!